William Terry, at his home. was one of the first patients in a hospital at home plan launched by Brigham and Women’s. Dr. William Terry arrived in the emergency room with a high fever and violent chills. When a suspicious spot turned up on his chest X-ray, doctors decided to admit Terry so they could provide intravenous antibiotics, track his vital signs, and be at his bedside. But before wheeling him up to an inpatient floor, staff at Brigham and Women’s Hospital brought him a small white envelope as part of a new study. A slip of paper inside contained a single word: home. With that, the Brigham set up the hospital room in Terry’s home instead, complete with monitors, oxygen, and daily rounds. As insurers and consumers struggle with ever-climbing hospital bills, the Brigham and Massachusetts General Hospital have launched programs that could seem counterintuitive: sending attending physicians, nurses and equipment into patients’ homes as a way to reduce health care costs while still providing safe and reliable care. While these pilot “hospital-at-home’’ programs bring the added expense of roving doctors and nurses, the hope is that they will reduce overall costs for insurers and patients by eliminating many hospital overhead charges. Hospitals in several other cities have tested the approach and found that it not only costs less than inpatient care but that patients generally have lower infection and readmission rates and are simply happier. 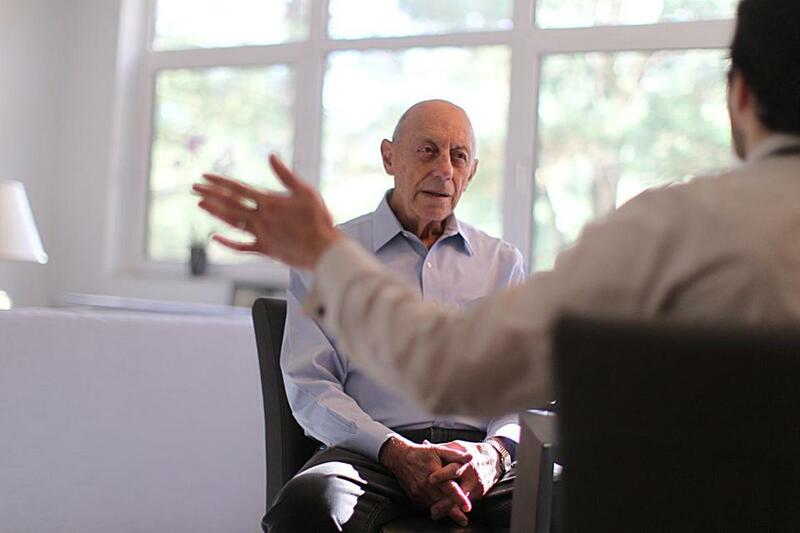 Terry, an 83-year-old researcher who lives in Chestnut Hill, was thrilled when he was randomly assigned to the group of patients admitted at home as part of a clinical trial in which he agreed to participate. His past experiences as a hospital patient involved roommates, unappealing food at preordained times, and sleep deprivation. The first morning, however, the safety of this new program was put to the test. Terry woke up at 5:30 with a tender, swollen patch along his right thigh. Within 15 minutes of contacting Dr. David Levine, the Brigham physician was there, lugging a more powerful antibiotic, vancomycin, in his giant backpack. “You are providing honestly the same level of care,’’ said Dr. Luis Ticona, who co-authored an article about hospital at home programs in a recent New England Journal of Medicine article. Ticona is also medical director of the Mass. General program, which began Monday. Hospital at home programs are common in England, France, and Australia. But the idea has failed to catch on in the United States, where hospitals could lose money under the traditional health care payment system if they emptied their profitable beds to treat patients at home — a service that is not as well reimbursed. Because insurers generally are not yet paying for home admissions, Partners HealthCare, the parent company of Mass. General and the Brigham, is picking up most of the bill for the new programs in hope they eventually lead to lower costs. Mass. General patients do not pay anything. Depending on their insurance, Brigham patients may pay their standard co-payment for a hospital admission. In New York City, the Icahn School of Medicine at Mount Sinai is using a $9.6 million three-year award from the Centers for Medicare and Medicaid Services to study the concept. Recent studies could help give doubters peace of mind. A review of the research published last month in JAMA Internal Medicine found that mortality and readmission rates for patients admitted at home were lower than or equal to those admitted to the hospital. The cost of a home admission was on average $2,000 less per patient than a hospital stay. A previous study at Presbyterian Healthcare Services in Albuquerque found a cost savings of 19 percent, largely because doctors ordered fewer tests for patients admitted at home — perhaps because they were less available — and discharged patients faster. “Everything is lining up to make this a big part of what hospitals do going forward,’’ said Dr. Timothy Ferris, senior vice president for population health at Partners and Mass General. The Brigham and Mass. General programs are limited to patients with pneumonia, heart failure, chronic obstructive pulmonary disease, and infections. These patients have traditionally been admitted to the hospital because they need certain treatments that are easier to give there. But they are not expected to need a major procedure or intensive care. For now patients in the new programs must live within 5 miles of the hospital in case they need to return quickly. At the Brigham, the program is part of a clinical trial comparing the cost and quality of care at home to hospitalization. Staff ask eligible patients in the emergency room if they want to enroll. If they agree, they are randomly assigned to home or the hospital. Emergency room patients at Mass. General who qualify for home admission are simply asked if they want that option. Levine and Ticona talk to patients about the risks and benefits of home admission. The chance of contracting an infection is lower at home. But the distance means it could take a nurse 15 to 20 minutes to reach a patient’s bed, as opposed to 5 minutes in the hospital. Some patients have declined for this reason. Todd Payton, 55, arrived at the Brigham emergency room recently because his congestive heart failure had worsened and fluid had collected around his lung. He agreed to participate in the study and was randomly assigned to home admission. Levine rode home with him in the ambulance. Over about two hours, Levine took a medical history and attached a small patch to Payton’s chest to wirelessly monitor heart rhythm, respiratory rate, temperature, falls, sleep, and how many steps he took during the day. A computer tablet sends these signals to caregivers and allows patients to text and conduct video visits. Abnormal vital signs sound an alarm on Levine’s phone. Levine started Payton on intravenous diuretics — the same treatment he had received during previous hospital stays — as well as meal delivery. One night the alarm on Levine’s phone buzzed, telling him no vital signs had come in from Payton for an hour. Levine called his patient’s home. Payton had fallen asleep on the tablet, blocking transmission. Brigham patients get at least one daily visit from a doctor and two from a nurse. Mass. General is leaning more heavily on nurse practitioners and nurses for its three daily visits, but physicians visit at least once during a patient’s admission and conduct daily calls. The key to the success of these programs, however, will be whether insurers ultimately agree to pay for the care. The cost needs to be less than a traditional hospital stay while still covering the hospital’s costs. Partners is already in discussions with Harvard Pilgrim Health Care. “We do believe it holds promise for certain types of patients,’’ said Rick Weisblatt, chief innovation and strategy officer at Harvard Pilgrim. But “a lot of promising programs did not save what we hoped they would save,” he warned. Insurers, for example, expected to save money when patients began to have orthopedic procedures done in outpatient facilities, eliminating a hospital stay. But the change prompted many more patients to undergo the procedures. Another risk is that doctors enroll patients in hospital at home programs who don’t actually need them. “They need to select the right patients,’’ said Nancy Kane, a professor at the Harvard School of Public Health. It’s also possible that hospitals could fill those newly-empty beds with more expensive patients, negating any savings to insurers. Then of course there is the question of patient preference. Payton, a mental health clinician, and Terry, an immunology researcher at the Brigham, gave the program high marks. But at Mount Sinai, about one-quarter of patients decline to participate, said Dr. Linda DeCherrie, clinical director of the mobile acute care team. Of those who do enroll, “the number one complaint is too many people knock on their door every day,’’ she said.